May usually brings May flowers, true, but here in Peoria that my or may not be the case. However that&apos;s not the case with Haymeadow Apts May Calendar of Events! And besides Mother&apos;s Day (you&apos;re welcome for the early reminder! 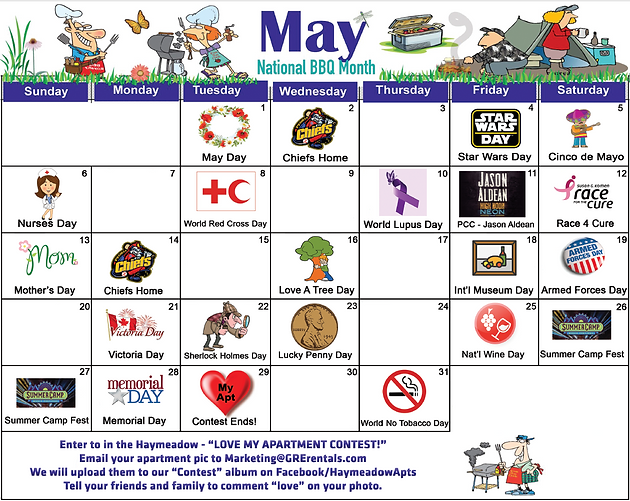 ), we have another contest for residents and have highlighted some local events, off-beat holidays, and other important May dates too. Welcome to May, everybody! Be sure to visit and bookmark our Calendar of Events page too!